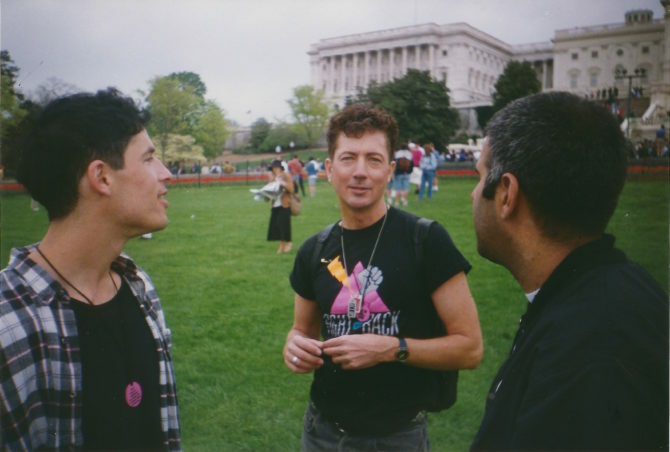 24 years ago today, on April 25, 1993, the The March on Washington for Lesbian, Gay, and Bi Equal Rights and Liberation took place in Washington, D.C. An estimated 1 million people attended. 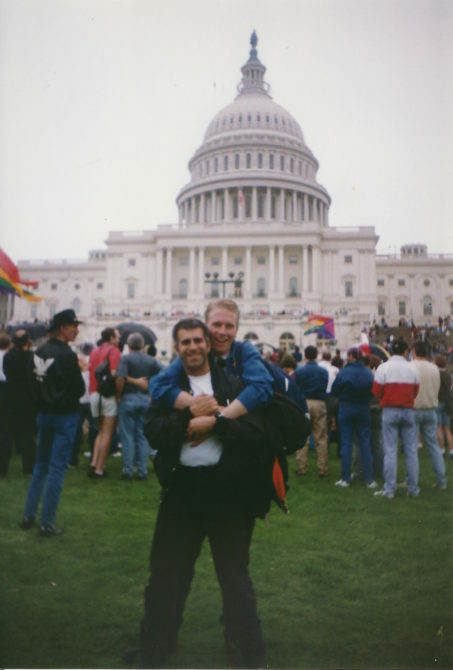 Protestors were there to demand equal rights and great visibility for LGBT Americans, as well as more funding for HIV/AIDS research and education, among other things. Professional publicist and grassroots activist Jay Blotcher (pictured) was one of the attendees. Armed with his Polaroid camera and newly resoled shoes, he hopped aboard bus from New York to Washington, D.C. to participate in the march with his ACT UP comrades. All weekend, I took photos of people, so for me it was all about the personal aspect of things. And about me and my friends hooking up with activists from other cities, to round out the fun. But the personal is political, of course. And you see photos of people having fun protesting with sweeping D.C. vistas and monuments around them, so the photos are certainly striking now. Today, I look back at what we accomplished that weekend with more respect and awe than when we were living the March on Washington in real time. 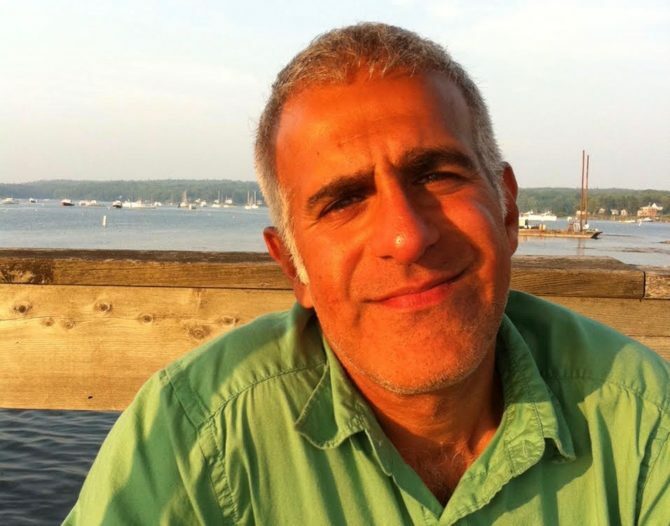 Today, Blotcher runs Public Impact Media Consultants, a strategic communications firm for progressive causes. Still very much an activist, he says it’s important LGBTQ people don’t give up the fight he and his friends began so many years ago. In the Trump reign of terror, LGBTQ people are public enemies just behind immigrants. Pence is a raving homophobe armed with a Bible, and I suspect he is driving most of the anti-LGBTQ orders emanating from the White House in the past few months. Younger LGBTQ people need to awaken to that reality. So many of our achievements and advancements are in danger of being lost. Politics were the main reason for journeying to DC. But once we got there, it was a non-stop citywide gay cocktail party; I bumped into friends from all over the country. Randy Spicochi from Los Angeles was my boss when I volunteered for GMHC’s AIDS Walk New York back in 1987. Randy is now an international personnel consultant. 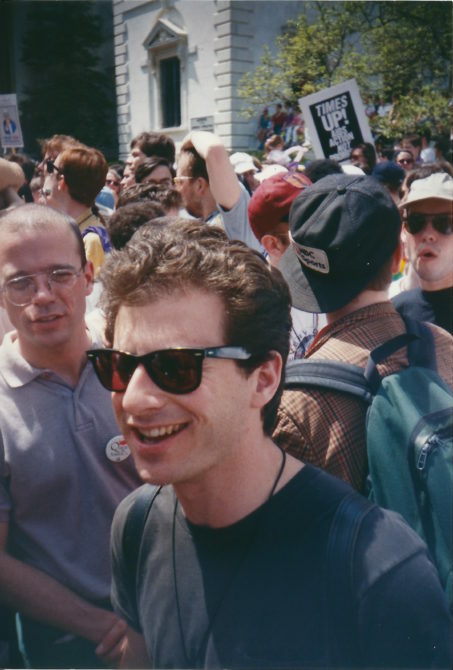 Aldyn McKean (1948-1994) was a charismatic and defiant member of ACT UP/NY. A former Broadway actor, he had a strong command of rhetoric wedded to a pitch-black sense of humor and more than a touch of star vanity, which he could laugh at. Fellow activist Paul Isaacs at left, is now a software guy in Seattle. I’m at the right. Jim Baggett of ACT UP/NY. As a member of The Marys affinity group, he brought the body of Tim Bailey to DC in July 1993 for a political funeral that resulted in a stand-off with police. Jim is now the garden editor of Better Homes and Gardens magazine. David Litke, a friend since college days who also became a member of ACT UP/NY. He is now a psychotherapist in New Jersey at the East Orange VA Medical Center. From left: ACT UP/NY comrades Ben Thornberry and Frank Smithson share my frustration in trying to sell those blasted medallion necklaces all weekend. 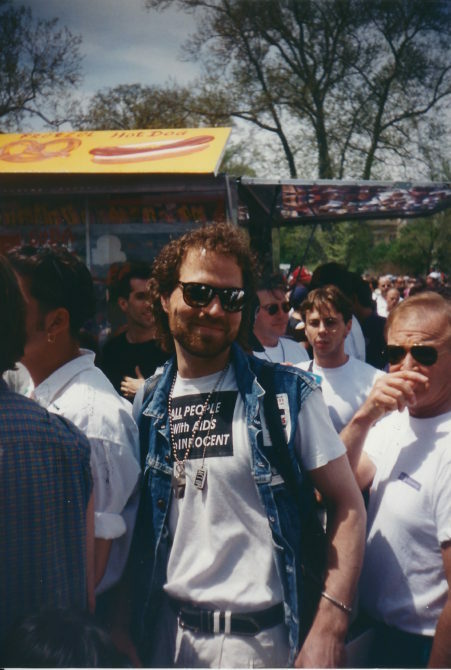 My “MOW boyfriend” that historic weekend was boyish and boisterous Duane Daugharty, an AIDS activist from Seattle. Our quest to find privacy for a sleepover was a comedy of errors; beds were in short supply. Duane was dead within a year, yet another casualty of the plague.